Before he was inaugurated as the 73rd Governor of the Commonwealth of Virginia, Ralph Northam served as an Army doctor, pediatric neurologist, business owner, state Senator and Lieutenant Governor. A native of Virginia’s Eastern Shore, Governor Northam was educated at the Virginia Military Institute (VMI), where he graduated with distinction. After graduation, Governor Northam was commissioned as a second lieutenant in the United States Army. He served eight years of active duty and rose to the rank of major. He attended Eastern Virginia Medical School and then traveled to San Antonio for a pediatric residency, where he met his wife Pamela, a pediatric occupational therapist at the same hospital. 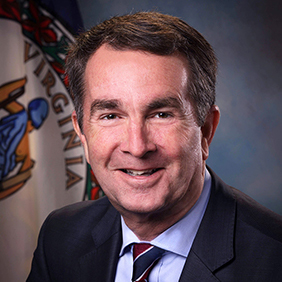 Governor Northam did his residencies at the Walter Reed Army Medical Center and served as chief neurological resident at Johns Hopkins Hospital. As an Army doctor, he served in Germany, treating soldiers wounded in Operation Desert Storm. When Governor Northam and Pamela returned home, they chose to build their life in Hampton Roads. He began practicing pediatric neurology at Children’s Hospital of the King’s Daughters in Norfolk. He established Children’s Specialty Group, his current medical practice, to provide expert pediatric care for patients. Governor Northam also served as assistant professor of neurology at Eastern Virginia Medical School, where he taught medicine and ethics. Governor Northam volunteered as medical director for the Edmarc Hospice for Children in Portsmouth, where he spent 18 years caring for terminally ill children. Governor Northam approaches public service with the same passion he brought to his military and medical service. He is committed to working with leaders from both parties to build a Virginia that works better for every family, no matter who they are or where they live. Governor Northam is the first native of the Eastern Shore to serve as Governor since Governor Henry A. Wise took office 1856. He is also the first VMI Keydet to serve as Governor since Governor Westmoreland Davis took office in 1918. Governor Northam and First Lady Pamela Northam have two adult children: Wes, a neurosurgical resident in Chapel Hill, and Aubrey, a web developer in Richmond.